Why don't I have all the money in the world so I can purchase all these gorgeous pairs of shoes?! I seriously need to invest in a new pair because I'm always in my nighthawks or chelsea boots, I need a change! 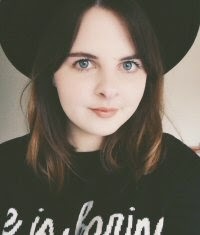 I've had the Topshop Parker Premiums on a few posts now, I can't stop loving them! But obviously (being a student) I can't afford these beauties, and will be hunting the web for some cheaper alternatives. I think the Atlanta ankle boots are a lot more reasonably priced for Topshop, for a good quality pair of boots. They are also so cool, I love the masculine look. I really like the Boohoo Jazmins, they are so cute for spring/summer, and they're at a reasonable price. This is the same with the River Island studded slipper shoes, I will hopefully be getting my mits on these, for a mere £15! 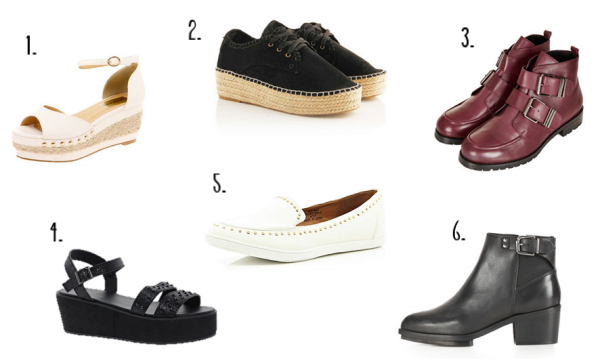 Flatforms are perfect for a night out, as your feet barely hurt in them! I've got a pair from River Island, but I think these ASOS ones are so cool with the studded detail! I was surprised they are only £28. These espidrilles are one of those items I've always wanted but never got round to buying. I think they would really add something to a casual outfit. Or even under dress a smart outfit for a casual look, like wearing them with a little dress. I think they would be so fun to style in the summer. love the topshop chelsea boots! I love numbers 3 and 6! your sense of good taste is definitely amazing! LOVING number 6! Right up my alley! I know, they are gorgeous arnt they! I love #5 & 6!